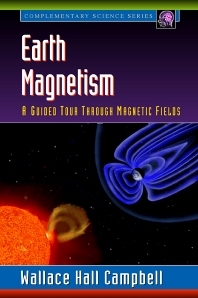 An introductory guide to global magnetic field properties, Earth Magnetism addresses, in non-technical prose, many of the frequently asked questions about Earth's magnetic field. Magnetism surrounds and penetrates our Earth in ways basic science courses can rarely address. It affects navigation, communication, and even the growth of crystals. As we observe and experience an 11-year solar maximum, we may witness spectacular satellite-destroying solar storms as they interact with our magnetic field. Written by an acknowledged expert in the field, this book will enrich courses in earth science, atmospheric science, geology, meteorology, geomagnetism, and geophysics. Contains nearly 200 original illustrations and eight pages of full-color plates. Integrates material from geomagnetism, paleomagnetism, and solar-terrestrial space physics. Anyone interested in the aurora borealis, solar flares, or geomagnetic storms.